Dunk your face deep into your bath tub filled with gold coins and breath through your scuba tube because this T-shirt introduces a fine example of the toys one should play with when you’re filthy rich enough to do all of that. I have no doubt that in the ’90s Scrooge McDuck inspired a whole generation of nerds to get filthy rich just so they could have their own tub full of gold coins. The rubber ducky is the only thing he was missing. I am all in on this idea. I’m ready to invest. 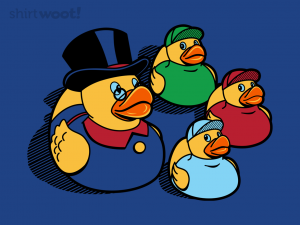 Who wants to make Duck Tales rubber duckies? We’ll be rich.